the pair of extensions leading from the frame front to the back of your ears is critical to proper fit in an eyeglass frame. Whether the eyeglass frames are brand new or Vintage and dated, the length of the temple arms will determine whether or not the frame front stays in place, keeping the lenses correctly placed relative to your eyes. The first and most obvious element of temple arms that effects the fit is of course the length, and while that may sound simple, it produces more than it’s share of problems for eyeglass wearers. The length of the temple arms is represented by the third number in an eyeglass frame-size formula, usually represented by a number between 130 and 155. The larger the number, the longer the temple arms overall, and while it is easy to call it the millimeter length, the curve at the end gives it’s “effective “ length a whole other meaning. It is interesting to note the solutions to this timeless problem from two completely different eras. Antique eyeglass frames from the Colonial period in America onward are frequently found to have been equipped with “slide extension” temple arms where two slotted sections can be pulled farther apart or pushed closer together to telescope to the correct length, held all the while by a tensioning rivet in the center of the slides. Several modern sport sunglasses are currently equipped with telescoping temple arms that use a notched sliding “tube-inside-a-tube” construction to offer infinite adjustment of the temple arm length within it’s range reminiscent of the earlier design. Never underestimate the ingenuity of people from earlier centuries, they will always surprise you. Just as we now might mistakenly think that convertible tops, roll up windows and sun visors came about with the advent of the automobile, history shows us that all these components were fully developed on the carriages pulled by horses before the first engine was ever placed on wheels. Another important aspect of temple arm fit is the effective width of the units themselves. Ironically, temples are not intended to touch your temples and should clear the skin in each side of your head while traveling back to the tops of your ears. Consider how frequently you encounter a person wearing an eyeglass frame that has the temple arms pressing into the skin on the side of their temples, resulting a reddened notch along each side of their face. Of course eyeglass frame width, represented by the first of the three-number size designation of a frame, is the critical starting point for proper fit, but fortunately there are some options. 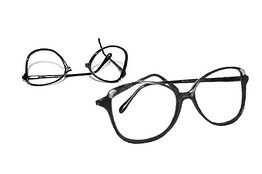 Even if the frame is a little narrow for the wearer, as is frequently the case with Vintage eyeglass frames, most temple arms can be effectively widened where they pass the temples by inducing a gentle “S” shape to them as they leave the hinge area, curving outward slightly, before curving back to continue without contacting the sides of the head to the top of the ear. Temple modification, coupled with the correct bending of the terminal curve and slight inward cant at the end of the tips, can complete a secure and comfortable eyeglass frame fit. At Framefixers, eyeglass nose pads are the most frequently submitted repairs resulting from “adjustment” that we receive at our facility. The eyeglass nose pad harps are the two small Sheppard crook shaped wires that are welded to the frame or embedded into the plastic of the frame that arch out and receive and hold the nose pads. These wires are frequently broken during “adjustment” and require a fairly complex repair of the frame. The middle number of your frame size, i.e. 48 / 20/145 refers to the nose bridge width. The first number is the frame size, and the last is the length of the temple arms. We of course remove the lenses and eyeglass nose pads, and weld or bond a new hard and pad assembly in place of the broken one. This is followed by white or yellow gold plating, or color lacquer applications to conceal and blend the repaired area back to the rest of the finish. When someone eyeglass nose pads and harps, they should be using nylon-lined pliers that do not have a serrated face on them that would leave a mark. Modern gold plating is generally fairly thin and does not hold up to edged tools. Additionally, one does not want to have bare metal, or worse, bare metal with a splinter of metal pushed up from the surface of the harp wire in proximity to the skin on the nose where the bridge is worn. A proper tool and a properly trained technician should be able to make all the necessary adjustments to the nose harp wire without damage or difficulty.Eyeglass nose pads attachment brings a whole additional set of problems to the proper replacement or adjustment of eyeglass nose pads. There are many types of mechanical methods for affixing eyeglass nose pads. The most common is the screw retainer type, where the nose pad has a stud with a hole in it that recedes into a receiver cup. The cup is then cross-drilled to receive a retainer screw, and the pad retention is complete. However, over tightening or overly strenuous removal of the screw can break off the body of the screw in the cup. This can turn a $750 dollar frame into a useless piece of metal and plastic if the screw body cannot be properly retracted and replaced. We have the drilling and threading machinery to do so and we perform this repair several hundred times each year.Along with the dozen different shapes and millimeter sizes of eyeglass nose pads, there are also a series called “snap-in” pads that have a mushroom stud that is either snapped through a yoke, or slides into a question mark shaped harp end to retain the pad. Unfortunately these are even more delicate and prone to break with improper tool abuse. Fortunately, we have all of the modern variants on these snap-on harp arms and are able to replace them when they are broken. Keep in mind that your frame should only touch your head where the nose pads touch the flanks of your nose, and where the temple arm ends are cradled in your ears. If the frame size and bridge size are correct for your head and face, there should be no need for extreme relocation of the eyeglass nose pad harps, and you should be able to enjoy your frames securely and consistently for years.